An Iraqi military spokesman said Sunday that militants fleeing a security crackdown in Baghdad have made areas outside the capital "breeding grounds for violence" after a week of deadly bombings and sectarian attacks. The most recent strike occurred at 12:15 p.m. Sunday when a bomb struck a popular market in Tuz Khormato, 130 miles north of Baghdad, killing three people and wounding four. It was the second attack in the city in as many days after two Iraqis seeking work were killed in a car bombing on Saturday. Brig. Gen. Qassim al-Moussawi promised the recent attacks would not derail the neighborhood-to-neighborhood sweep that began in Baghdad on Feb. 14. "We are not going back. We have achieved progress and we are going to continue this progress. We need the cooperation of the Iraq people with the Iraqi security forces. Iraqi people should give more tips about ammunition and weapons caches." He acknowledged an increase in violence outside Baghdad even as the death toll is down in the capital but said the security crackdown was providing an example of how to fight it. "The fact that the violence decreased in Baghdad, the terrorists went to the surrounding areas and these areas are breeding grounds for violence ... tribal leaders are carrying operations against them," he said. "The terrorist elements are backed into a corner and we are going to continue to carry out these operations." U.S. military spokesman Rear Adm. Mark Fox also expressed confidence in the security sweep, saying half of the U.S. troop reinforcements are in place, but he warned it would not be easy to pacify the capital and asked for patience. 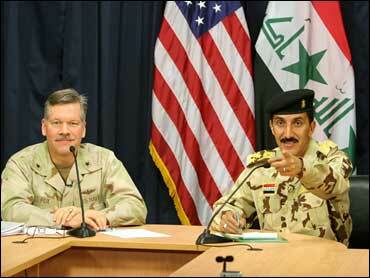 "The effort to exert security in Iraq will take time," Fox said at a joint news conference with al-Moussawi. "Our job will not be accomplished within days or weeks." "We are going to see more violence in the coming weeks and months," he added. The comments came after a week in which more than 500 Iraqis were killed in sectarian violence, most in a series of high-profile suicide bombings. The Iraqi Interior Ministry on Saturday raised the death toll in Tuesday's suicide truck bombing against a Shiite market in Tal Afar that was blamed on al Qaeda to 152, which would make it the deadliest single strike since the war started four years ago. That bombing was followed by a shooting rampage against Sunnis that left at least 45 people dead. Two suicide vests were found unexploded Saturday in the heavily fortified Green Zone in Baghdad, less than a week after a rocket attack killed two Americans in the vast central area. Kurdish lawmakers struck back against criticism over the Iraqi government's decision to endorse plans to relocate thousands of Arabs who were moved to the northern city of Kirkuk as part of Saddam Hussein's campaign to force ethnic Kurds out of the oil-rich city, in an effort to undo one of the former dictator's most enduring and hated policies. In other violence Sunday, two top Sunni officials escaped an assassination attempt in one Baghdad's most restive neighborhoods. Omar Abdul-Sattar of the National Accordance Front, the biggest Sunni parliamentary block with 44 seats, and Omar al-Jubouri, an aide to Sunni Vice President Tariq al-Hashemi, were targeted by a roadside bomb when their convoy was passing through Yarmouk in western Baghdad, police said. Nobody was killed in the attack, but it came amid a recent rise in violence by suspected Sunni insurgents against members of the minority Islamic sect who are affiliated with the political process. A British soldier was seriously wounded by small-arms fire Sunday while on patrol in the southern city of Basra, a military spokeswoman said. Some 125 British personnel have died in Iraq since the U.S.-led invasion four years ago. British Prime Minister Tony Blair has announced that Britain will reduce its force in Iraq from 7,100 to 5,500 in the coming months. A British resident, back in London after nearly five years at the Guantanamo Bay prison camp, said his "nightmare is at an end." Bisher al-Rawi, an Iraqi national, has lived with his family in Britain since 1985. He had been at the U.S. prison camp in Cuba since 2002 when he was arrested in Gambia as an alleged al-Qaeda associate. Lawyers claim that after his arrest in 2002, he and a friend ended up in American custody, when they were taken on a rendition flight through Egypt to a CIA facility in Afghanistan, where they were held and interrogated as suspected terrorists in a CIA underground prison close to Kabul before being transferred to Guantanamo Bay. Al-Rawi said prisoners get asked the same questions hundreds of times, and while the allegations "are laughably untrue," he said there is no chance to prove them wrong. "No trial. No fair legal process," he said, in an existence rife with "extreme isolation" and feeling of hopelessness. Britain took an interest in his case after it was disclosed he had helped the British spy agency, MI5. Though freed, al-Rawi said several other British citizens still at Guantanamo have gone on a hunger strike to protest conditions.